Single channel AC/DC Power Meter Suitable for High Accuracy Measurements of Standby Power. You have chosen the standard Hioki PW3335 with a LAN & RS-232C interface. 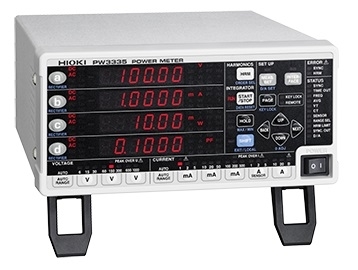 The Hioki PW3335 is single channel direct input AC/DC power meters is designed to precisely measure the power consumption of electrical household appliances and components including the low level measurement of standby power. It is able to measure and display voltage, current, frequency, active power, apparent power, reactive power, power factor, phase angle plus energy consumed. This product will help you demonstrate your compliance with the eco-design criteria of the ErP Directive. What we like: The Hioki PW3335 Power Meter allows you to change the power meters display to show the variables that you are wish to monitor. It also offers up to seven 0…2V/5V DC analogue outputs that are proportional to the measured voltage, current, active power and active energy these can support external data loggers or production control systems. It offers high levels accuracy for voltage, current and active power at ±0.1% rdg ± 0.1%fs. The integrated LAN connection allows for remote viewing and operation through a standard web browser. Power meter monitoring range 0…1000V AC/DC, 0…30A AC/DC, 0…9kW. Low current monitoring down to 0.1µA on lowest range 0…1.0000mA with effective measurements from 0.0100mA…1.0000mA. 14 current measurement ranges from 0…100.00mA to 0…20.000A all with effective measurement from 1%...150% of range. High basic accuracy for voltage, current and active power is ±0.1% rdg ± 0.1%fs. Wide power supply 100…240V AC. LAN & RS-232C Interface included as standard allows you to communicate with PC. The family of Hioki benchtop power meters and power analyzers are best in class power measuring instruments for measuring single to three-phase systems with a high degree of precision and accuracy. The Hioki PW3335 is single channel direct input AC/DC power meters designed to precisely measure the power consumption of electrical household appliances. The PW3335 delivers high measurement accuracy and handles currents with higher crest values in lower current ranges to greatly help reduce power measurement uncertainty, especially critical when the measured standby power is at μA levels. The Hioki PW3335 is such a compact design taking up little space on your bench top at just 210mm (W) x 100mm (H) x 245 (D). A large screw terminal block suitable for voltages up to 1000V and current up to 30A allows for safe secure connections.